A weekend during which all monsters will resurrect from their graves at an enormous speed is ahead, fellow Tibians. Rumours have it that the winter update might be released a couple of days before the event, which makes it a perfect opportunity to unlock some of the new Bestiary entries! Between the server saves of December 07 and December 10, all monsters will respawn five times faster. 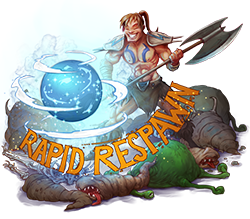 Areas with an active improved respawn area bonus yield an even faster respawn time. Save the date!